Global economic data continues to exceed expectations, throwing more fuel on this year’s stock market rally. Domestic stocks touched new highs again in November on tax reform optimism, driving the S&P 500 index to a record 13th straight month of gains. For the year, the S&P 500 shows a 20.5% return, including dividends. The 10-year Treasury finished the month at a 2.39% yield, but the focus has been on the continued flattening of the yield curve. The spread between the yield on 10-year and 2-year Treasury bonds fell to 0.58%, the lowest level in a decade. Long-term yields have refused to follow short-term rates higher as inflation risks remain subdued and growth expectations remain anchored. While the Fed continues its plan to hike short-term rates this month and possibly a few more times in 2018, a flatter yield curve could present a conundrum as an inverted yield curve historically signals greater recession risk. In the meantime, unabashed enthusiasm for stocks continues, driven by the view that lower tax rates and deregulation will go straight to the bottom line of businesses. The downside risk is that investors are setting aside geopolitical risks, historically high stock values, and other potential issues and assuming stocks will just continue on a straight upward trajectory. John Maynard Keynes, in his 1936 book The General Theory of Employment, Interest, and Money, coined the term “animal spirits” to describe the emotions and proclivities that drive capital investment. While we are enjoying the ride, we also caution that bull markets eventually come to an end for any number of reasons. It’s hard to open a newspaper without reading about the latest bitcoin news. Digital currencies have seen rapid price appreciation this year with bitcoin gaining 1,236% YTD. As an unregulated, decentralized unit of exchange, bitcoin’s primary function is to facilitate illicit activities and move large amounts of wealth across borders without detection from government authorities. In that respect, it is better than gold, which is too heavy to carry significant sums in a backpack. Neither gold nor bitcoin can be exchanged for many goods right now. Aside from a few online retailers and some ultra-hip coffee shops, bitcoins must be converted to a traditional currency before purchasing anything. While it’s not likely that bitcoin will ever replace the U.S. Dollar, some countries as well as the U.S. Federal Reserve have indicated they are exploring the use of digital currencies. 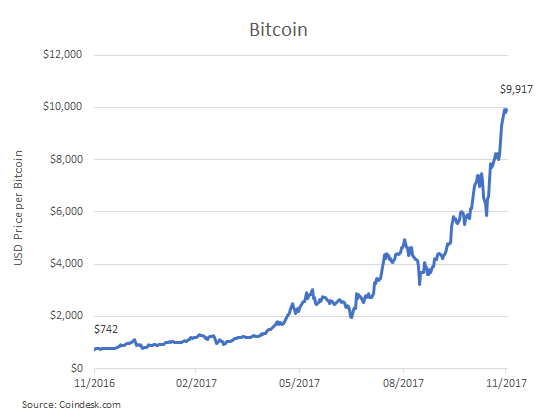 Of course, the price of bitcoin doesn’t always go up, and there have been a number of massive pullbacks in its short history. Bitcoin fell over 81% in 2014 when a hack resulted in 850,000 bitcoins being stolen from a large exchange. Volatility hasn’t been contained to that one event either. In fact, the price of bitcoin fluctuates so much that you may have to come up with more bitcoin to pay for your latte in the time it takes to pull out your smartphone. We are skeptical that bitcoin belongs in an investor’s portfolio. Like gold, bitcoin does not pay a dividend or coupon income. The value of bitcoin is determined only by the ability to sell it to someone else who thinks it’s worth more than you do. In our view, gold only deserves a role in a portfolio simply because it has a history of performing well when other asset values decline. It’s too early to tell if bitcoin will possess this same safe-haven characteristic. The mania and rapid price appreciation suggests there is a lot of hype and hysteria about digital currencies. With this much speculation, we doubt bitcoin will exhibit the insurance-like qualities needed to fit into a balanced portfolio. The real benefit may come from the technology supporting bitcoin. Blockchain is a unique electronic ledger that threatens to upend the antiquated payment and settlement processes for banks and other financial custodians. Also, the race for computational power required to mine bitcoins may drive innovation in microchip manufacturers that may yield benefits in other industries. While digital currencies are likely here to stay, society may benefit more from the ancillary technological advances in ways we can’t yet fully appreciate. We previously discussed a core-satellite strategy for pulling together the key elements of a cost efficient, well-diversified investment portfolio. We argued that the core of such a portfolio should consist of broad-based index funds, specifically low-cost, tax-efficient funds that replicate specific segments of the financial markets. Holding a portfolio that contains all the stocks in a given market segment in proportion to their relative size, or capitalization, is the most assured way to capture the market return at the lowest cost. A true “cap-weighted” portfolio minimizes trading and is tax efficient. There is ample evidence to support the fact cap-weighted index funds consistently provide higher net returns for investors than actively traded funds that try to beat the market. With the advent of increasingly popular exchange-traded funds (ETFs), the concept of indexing has taken on new meaning, since by definition all ETFs are based on a basket of underlying securities. For example, so-called “smart beta” funds attempt to tilt the fund to favor “value” stocks over “growth” stocks, or small companies over large firms. Other tilts include quality, high dividends, momentum, and equal-weighted versus capitalization-weighted – the list seems to expand almost daily. Unfortunately, new financial products often benefit those touting the new products more than those purchasing them. Smart beta ETFs are one of the latest iterations in Wall Street’s endless product development cycle. They are sold as a better way to seek passive index exposure but are not a substitute for cap-weighted portfolios. Smart beta funds, despite their misleading advertising, may be an improvement over old-school actively managed funds, yet they still increase costs and risks. Despite their marketing hype, smart beta funds will likely lag cap-weighted funds over time after transaction and management costs. Holding a passel of ETFs does not mean your portfolio is passive, diversified, liquid, or even low-cost. These new indexes essentially move active management out of the fund and into the creation of the special index. Most of these ETFs do not offer the broad market exposure that should be at the core of a well-diversified portfolio. Despite some early warning signs from the bond market, our sanguine view of the markets continues to hold. We see the global economy continuing to expand, regardless of the final outcome of tax reform. 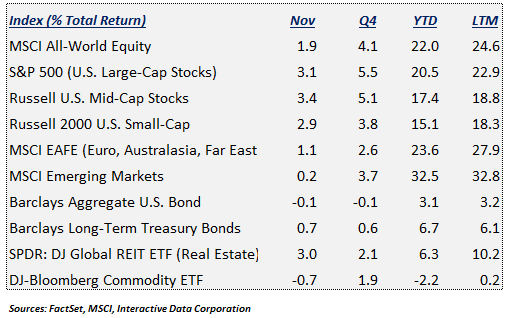 In our equity portfolios, we are carefully watching sectors and stocks that have performed well after reaching lofty valuations, and we continue to rebalance and reduce outsized positions. In bond portfolios, we are avoiding lower quality corporate bonds, as their return prospects pale in comparison to their potential losses should the economy falter unexpectedly. 2017 has produced mostly gains in our client’s stock portfolios, presenting few opportunities for tax loss harvesting. It’s a good problem to have, but we are working with a couple of stock positions that could provide a small bit of help on the tax front. A cap-weighted index incorporates all the best information from the most astute players in the market and ensures that you receive a return commensurate with the level of risk you decide to take. Anything other than a cap-weighted portfolio risks falling short of that critical mark. Missing by even a small percentage year in and year out can significantly reduce your wealth. It is extremely difficult to know ahead of time which stocks will outperform. Some stocks surprise on the upside while others, often with glowing prospects, disappoint. While there are valid reasons to invest in other strategies with a select and predetermined portion of your investments, we believe a well-structured core-satellite portfolio with a cap-weighted core is the best way to manage risk and achieve long-term success. Happy holidays. Please let us know how we can help you.